When it comes to spending money, we're more inclined to splurge on fun purchases—dinner out, new clothes, vacations—than on household necessities, especially when we're going to throw those items (think: trash bags, paper towels) away. In order to help take the sting out of housekeeping costs, we've rounded up our best tips and tricks for saving money and keeping a clean home. 1. Use coupons. Using coupons and rebates can save a lot of money off of your household budget. Check the Sunday edition of your newspaper for coupons. If you have products you consistently purchase, manufacturer's websites may have printable coupons. And don't forget about rebates! While less common, mail-in rebates are still a promotional tool used by manufacturers, and can save major bucks. Find out what is needed to redeem the rebate (cash register receipt, barcode label, etc.) Don't throw out a rebate just because it takes extra effort for savings that don't happen right away. By the time the product runs out you may have the rebate in hand to replace it. 2. Get free samples. Many times manufacturer's will send out free samples of new and innovative products. Following a brand's Facebook page or following sites that track free samples is one way to make sure you won't miss out. 3. Download apps. Retailers and grocery stores often have their own apps for coupons. Target's Cartwheel app, for example, regularly offers discounts on store-brand products in addition to special sales on featured items or departments. Other couponing apps help aggregate discounts across multiple stores. 4. Shop around. Find the best deals on the products you can't live without. Check out store circulars. Shop at dollar stores or at discount warehouses. Buying products in bulk is a great way to save money on staples like garbage bags and cleaning products. Don't have the space to store 50 rolls of paper towels? Consider splitting the loot (and the cost) with a friend. 5. Plan a cleaning budget. Planning a cleaning budget can help prevent impulse buying. To really get a feel for what your budget needs to be, track your spending on cleaning products over the course of a few months. Sit down and analyze where the money was spent. Determine what items were really not needed and which ones cannot be done without. This will help you figure out how long your products are lasting and decide if you should swap brands. Use the information to create a budget for your family's cleaning needs. 6. Follow the directions. Following the manufacturer's recommendations makes sure that no expensive mistakes occur as the result of use. Many people overuse cleaning products to try to get done more quickly, with the only result being a hiked up cleaning budget. The directions give you an idea of how much is needed to get a cleaning job done. According to the Wall Street Journal, household appliances like dishwashers and washing machines are now built to use less water and actually require less soap. Many detergents are also available in more concentrated formulas, so a little bit of product goes farther. 7. Spot treat stains ASAP. Spills and stains are bound to happen, but your initial reaction to the mess makes all the difference. Fast attention prevents more expensive repairs or removals later on. Treat the stain before it has a chance to "set". 8. Line dry your clothes. Line drying your clothes has many benefits that can save money. Eliminating the dryer cuts down on utility costs needed for its operation, but also prevents added cooling costs for your home. Bonus: Repeated rounds in the dryer can wear on clothes, which means they need to be replaced more frequently. Line drying helps to extend the life of your favorite tees and linens. 9. Use the right tool for the job. All messes aren't created equal. Don't use your regular household vacuum when the mess calls for a Shop-Vac. Using the wrong appliance to clean up a mess will lead to wear and potential damage. 10. Share a steam cleaner. Go in with a few friends or family members and purchase a nice steam cleaner together. Work out a plan for everyone to have access to it for routine maintenance, and the occasional emergency. 12. Reuse. Find ways to reuse items in your home for cleaning purposes. Try cutting up towels or clothing into cleaning rags. These can be hemmed on a sewing machine and washed in the washing machine to reduce the need for disposable cloths. 13. Repurpose old newspapers. Newspapers can be used to dry mirrors and windows after washing. 14. Make your own cleaning products. Certain pantry staples can pull double-duty has cleaning products. You can also easily make your own cleaning products, like disinfectants and stain removers at home. 15. Use lemon juice in lieu of bleach. Lemon juice can be especially effective on white clothing when left in sunlight. The juice will bleach out the stains, but take care—it will also bleach out color. 16. Create your own air freshener. Fill a saucepan half full of water cinnamon sticks, orange peels, and some cloves. Simmer on the stovetop, adding water as the mixture reduces. It will fill your home with a great smell and can help eliminate lingering odors from cooking. 17. Maintain a tidy house. Use maintenance as a weapon against tough jobs that will require more effort and tools. Setting up a cleaning schedule will help you build maintenance of chores into your daily life. Letting jobs go too long will only take more time and money at a later point to fix. 18. Keep your tools in good shape. Taking good care of your tools keeps them going longer. Make sure to do routine inspections of vacuum cleaners, dishwashers, garbage disposals, washing machines, and dryers. Keep brushes, dustpans, brooms, mops, and sponges clean and ready to be used. Don't forget to clean out filters, belts, bags and other accessories for your cleaning tools. 19. Buy easily cared for fabrics. Read the label before you buy. A dry-clean only, no iron blouse may look great on you but is it worth the added cost of the dry cleaners or home dry-cleaning products. You probably can't stay away from all special care items, but reducing them in your home can reduce your costs. 20. Use energy efficient appliances. Check out the government's recommendations for energy efficient appliances. 21. Use one-pot recipes for meals. This will not only save you money on washing the dishes, but also give you more time to enjoy after dinner. Browse some of our favorite one-pot recipes. 22. Invest in entrance mats. Having a doormat directly inside and outside each entrance can reduce the amount of dirt being tracked on your floors. 23. Implement a "no shoe" rule. Go barefoot and give your floors a break. While some people post a sign on the door asking guests to remove their shoes, many guests will voluntarily take them off when they see a selection of the family's footwear lined up in the entryway. 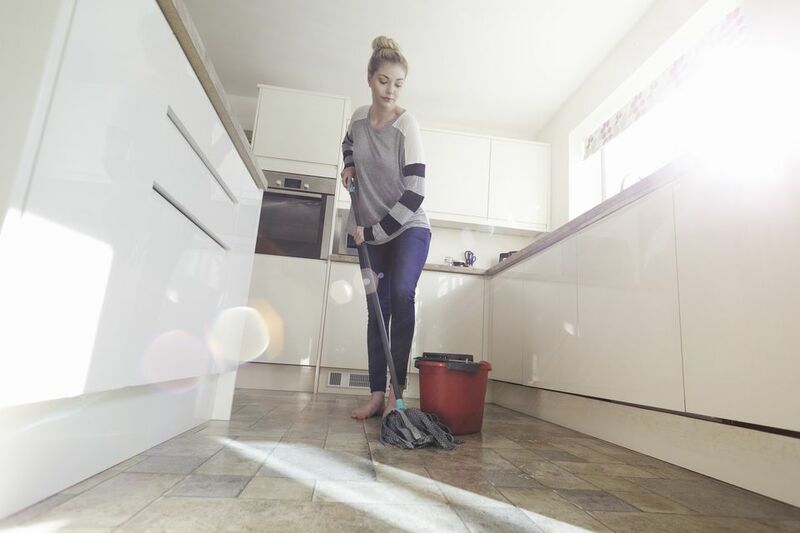 Even if you keep only family and close friends shoeless you'll save a lot of wear and tear on floor cleaning costs. 24. Use the library. Don't run out to buy the latest "life changing" lifestyle manifesto. Check out the library to preview the newest books and magazines to help your housekeeping needs. Some books or magazines may turn into favorites, making them a candidate for purchase. 25. Read reviews. Before you buy into the latest cleaning craze, find out if it really works. Talk with friends and family members who may have used the product already. Check out product reviews online.